My grandmother taught me to crochet a few years back, but I’d forgotten most of that education, given all that’s distracted me over the past few years. So when she made the last-minute decision to come home from Florida for Christmas, I knew just how we’d spend some of our time together. It didn’t take much to refresh my memory, though it took a little while for my hand to figure out how to manipulate the crochet needle; I have nerve damage in my lower right thumb, where it meets my palm, which limits my dexterity. But the repetitive motion turned out to be great physical therapy for me, and of course, it’s the perfect pastime for relaxing my brain (or at least, relaxing that prefrontal cortex a bit and engaging my basal ganglia). And it’s the ideal activity after a day of writing; when I can unwind my brain (like a big ole skein of yarn), new ideas and connections and solutions start revealing themselves. And it means I can make stuff! The photo above is the edge of a wrap I made for myself, using a free pattern I found online; it’s a little grannyish (not that there’s ANYTHING wrong with that) and perfect to keep right by the bed, so I can throw it on and shuffle off to the kitchen to make myself some morning coffee. Over the past month, I’ve also made one scarf and started another, and I’m in the midst of making a little blanket to throw over the back of our couch for Shoogie, who likes to fall asleep there. Basically, I’m an unstoppable crocheting machine now. Kara, a friend recently taught me to crochet. The ultimate goal is to crochet those adorable amigurumi animals. But, right now all I’m capable of is a straight, basic stitch. I’ve made 6 scarves so far! OMG, I love Amigurumi! That is a worthy goal. Are you doing single crochet stitches, or double crochet? 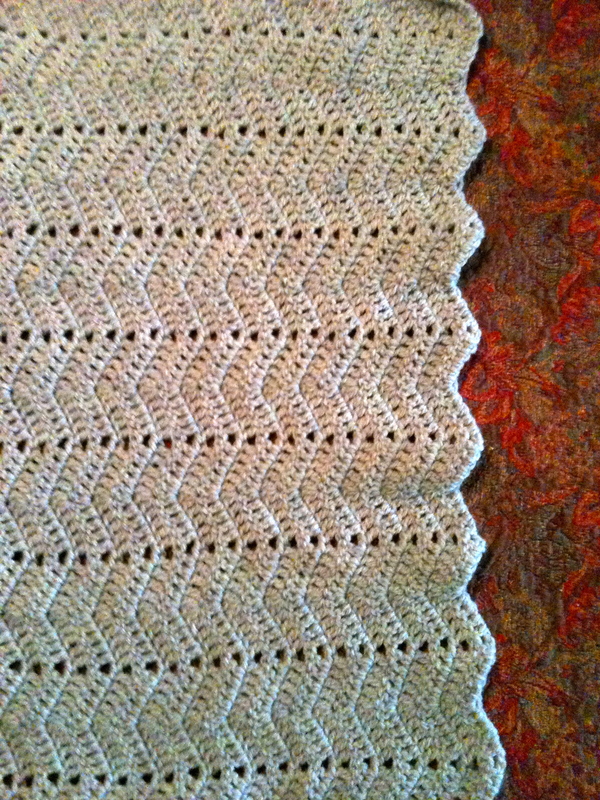 The wrap I made is all double crochet — you just skip stitches in certain places and repeat stitches in others. Single crochet. The friend teaching me is in England, so going is slow 🙂 She’s coming here in May. We should all meet for a crochet session – she can teach you, too! But, meanwhile, now we really have to get together and you can show me the double crochet. Coffee, crochet, conversation. I’m ready!